Of all the colored-leaf Japanese Maples available, the Garnet Japanese Maple is the most spectacular. It forms a marvelous broad, upright small tree with pendulous branches sweeping down. In spring the leaves emerge an astounding red-orange, which holds into the summer. Then in fall they turn an amazing deep-red, just like the garnet gemstone. Its small size makes it ideal as a container tree, where it will grace your deck, patio or courtyard for many years, growing in beauty and elegance like a rare family jewel. The classic weeping Japanese maple has finely divided leaves and grows into a broad, cascading form. 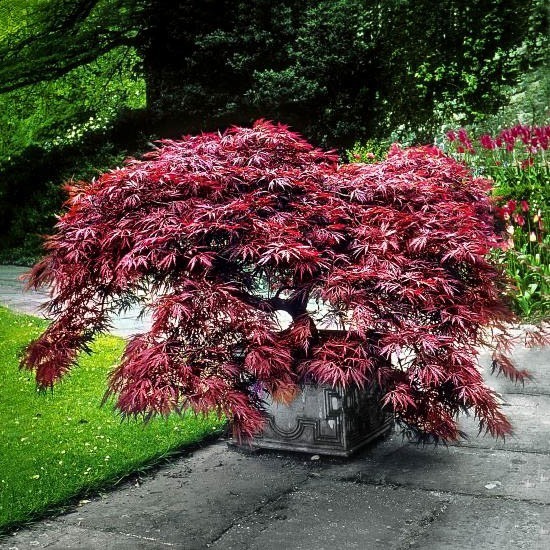 The Garnet Japanese Maple ticks all those boxes, plus spectacular foliage color in spring and fall, creating an ever-changing feature in your garden. When you want a small tree to add interest and texture to your outdoor space this one must be at the top of your list. A garden built entirely around flower beds can be beautifully laid out, intricate and colorful, but it’s always going to be lacking a certain something. Trees add the missing element. They let your garden break free of the ground and extend itself into three dimensions. As well as this visual effect they can also have practical benefits, such as providing shade – either for relaxation or to protect smaller, more fragile plants – and creating a habitat for a huge variety of birds, animals and insects. One especially attractive tree that’s earned a devoted following among gardeners is the Japanese Maple (Acer palmatum). This is a relatively small tree (or large shrub) that’s ideal on its own in smaller gardens or located near larger trees in a more extensive space. Native to Japan, China, Korea, Mongolia and Russia’s Pacific coast it’s been cultivated in Japan for hundreds of years and started to appear in many temperate gardens in the early 19th century. Now it’s a well-established favorite, and for a lot of very good reasons. All Japanese Maples are attractive trees, but with its combination of compact size, elegant form and beautiful red foliage the Garnet is something special. 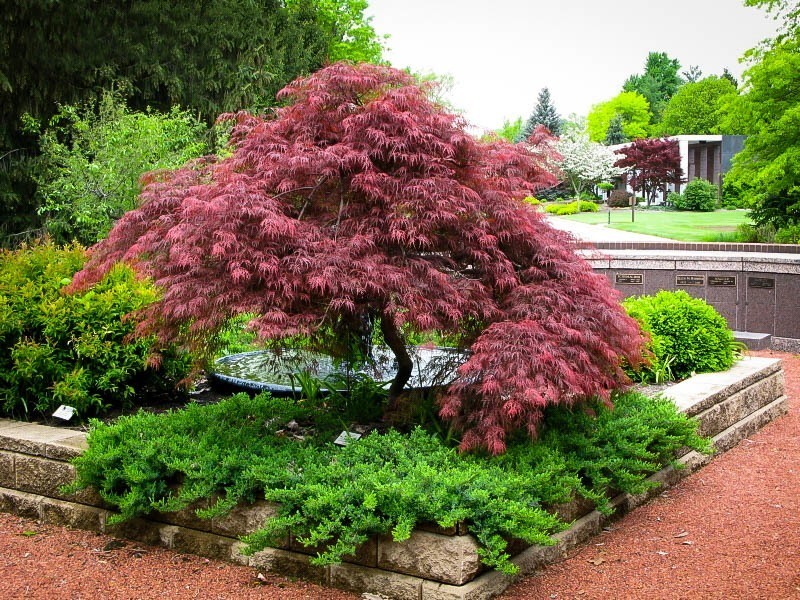 If you’re looking for a centerpiece or accent tree this is one you definitely have to consider – if you have the right soil for it you can use one of our high quality Garnets to create a spectacular scene in your garden. The popular red-leaved “Garnet” cultivar of the Japanese Maple is a compact tree that usually reaches a height of between ten and twelve feet when mature, and spreads to a similar width. In exceptional cases it can reach up to 25 feet in both height and width. It usually forms an attractive dome shape, often splitting into multiple trunks close to the ground and with the bottom branches fairly low. It’s too small and low-hanging to make an ideal shade tree but its wide span does create an ideal habitat for small shrubs and borders that need some protection from the sun. The Japanese Maple’s biological name, palmatum, comes from the shape of its leaves, which are usually from two to four inches long and have five or seven – sometimes nine – fingerlike lobes in the classic Maple form. In spring the new foliage is a vivid red, shortly joined by a generous crop of flowers. These are small and not highly visible at a distance, but the effect is to give the tree a sheen of additional color. In summer, the flowers are replaced by samara – winged seed pods – which gradually take on the red color of the foliage as they ripen towards fall. Finally, when fall arrives, the already spectacular foliage transforms into a riot of reddish-purple and deep yellows. Its distinctive colors make it ideal either as a standalone or as an accent tree to add interest to spaces that already contain plentiful green foliage. Garnet Japanese Maple isn’t just beautiful. It will also attract butterflies and beneficial insects to its flowers through spring and summer, and in fall songbirds will congregate to feed on the samaras. This is a tree that, despite being highly ornamental, is very much a useful part of the natural world and will enhance the ecosystem of your garden. The Japanese Maple isn’t suitable for arid areas; it prefers a light, moist but well-drained soil, ideally acidic (although it can tolerate neutral soil too). It’s relatively hardy, doing well in USDA zones 5 to 8 – that means it can be planted across most of the continental USA with the exceptions of Alaska, the extreme north of New England and the Midwest, or the more arid regions towards the Mexican border and Gulf coast. Once it’s mature – around five years old – it can tolerate winter temperatures of down to -30°C, and it also thrives in direct sunlight as long as you keep the roots moist. A four inch organic mulch is the ideal way to do this, although seeding grass right up to the trunk and keeping it well watered will also work – just be careful to avoid mower damage if you do this. When choosing a location for your Garnet look for a sunny spot. It will grow in partial shade but the foliage will probably be less vivid; to bring out its full beauty place it where it will be well lit. Do try to find a place that won’t be exposed to the full force of winds, though; cold wind can dull the leaves in fall and may damage smaller twigs in winter. Apart from keeping the roots moist, Garnet doesn’t need a lot of care. If fertilizer is needed – it usually isn’t – a balanced slow release one will be perfect. Most gardeners leave them unpruned; the natural shape is already attractive, and each tree is unique. However if you do want to prune it only do so in spring after any risk of frost has passed, through to early summer. One measure of the Garnet’s flexibility is that it can be pruned and shaped as a bonsai.